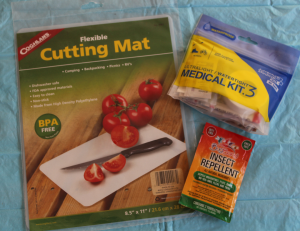 Coghlan's cutting board, Adventure Medical Kit, and BugBand allnatural, DEET free insect repellant. All are sitting on an inexpensive picnic table cover, a great, lightweight bike touring accessory. Whether you are backpacking or bicycle touring the word “accessory” typically means more weight and less space in your backpack or pannier. When it comes to bike touring weight, I generally try for a 2:1 ratio compared to backpacking. So if my backpack and everything in it weighs 35 lbs then my bike and everything on it should weigh 70 lbs. It usually doesn’t quite work out that way. I know I carry too much stuff on my bike tours, including accessories. Accessories can be helpful. They can make your trip more comfortable, more convenient, safer and perhaps more fun. There really are no right or wrong answers to bike packing, just consequences. Do you want to take that small point and shoot camera, or do you take a camera capable of high-resolution professional photos. For this article I’m not going to talk about on the bike accessories such as pumps, bells, fenders, etc. but items that you may not think about on your trip that hopefully will meet the definition of comfort, convenience, safety (hygienic) or fun. Of course you may agree or disagree with my choices. The first “accessory” that Julie and I took on a trip was a bright yellow stadium seat. This 9-ounce cushion attaches to the rear of Julie’s bike to become a noticeable object for cars to see. In the campground it cushions the picnic tables or the ground and creates a dry sitting pad. At night it lies under her feet for a little insulation adding to her ¾-length sleeping pad. We receive a lot of comments; “what’s that for”, when people look at the yellow disc on the back of her bike. One could use very light packing material or the many small lightweight cushions” sold at REI to do a similar job. One could then add yellow duct tape to one side for the back of the bike. This item meets the comfort and perhaps safety criteria. Our next accessory was a picnic table cover, a thin plastic wrap for the more than occasional picnic table with bird droppings or other debris. Even after cleaning such tables we ate better having a clean surface. It brings a touch of home to a campground. Sometimes we use it “picnic-style” when no table exists. The table cover weighs 2.5 ounces and covers ¾ of the length of the average picnic table. The uncovered space is used for my stove. You can buy a plastic table cover in any camping section of a store that sells car camping stuff or just use a piece of durable plastic sheeting, perhaps a large garbage bag. This accessory meets the hygiene and comfort criteria. 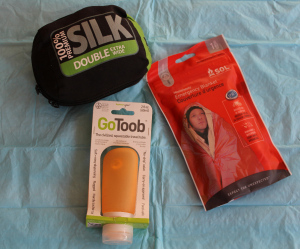 Sea to Summit silk sleeping bag liner, SOL emergency blanket, and GoToob flexible food storage container. On our most recent bike tour we tried out a new “cutting board”. This wasn’t just a cutting board but a 1.5-ounce, 8.5 X 11-inch piece of plastic that could be also used as a place mat. If a tablecloth seems too decadent or if you are a solo tourer, you may want to consider the Coghlan’s flexible cutting board ($2.59; sometimes on sale at Ace hardware for $1). It fits nicely along the rigid side of a front pannier. If you’ve ever stopped to eat where a table is not available (think German campgrounds), this small item will give you space to set a sandwich and fruit on. We found this item to be indispensable not only as a placemat but also to serve cut up fruit and vegetables. Ace hardware sells a similar Chef Craft ($2.59) model that is 12X15 inches. Heavier weight cutting boards are sold at REI. First aid kits are always difficult to put together. Complete kits for every emergency will weigh more than you may want and take a lot of space. Minimal kits have, well a minimum of stuff, perhaps not enough. Julie and I both work in medicine so we tend to go on the minimum side of first aid kits assuming we can improvise on the rest. Adventure Medical Kits make an “ultralight” Medical Kit.3 that comes very close to what Julie and I pack. It weighs 3 ounces and in my opinion, only needs a larger number of ibuprofen tablets. Of course, each individual may want to add something for their personal needs. Obviously a first aid kit meets the safety criteria. The .3 kit sells for $9 on the Adventure Medical Kit website. One can become overloaded with accessory bottles and other containers. The question becomes do you buy small expensive sizes or pour stuff from a large container into a small container such a lotions or condiments when traveling. Some are rigid therefore take up the same amount of space whether full or empty. Humangear (humangear.com) makes a number of products for travelers. I was given a Go-Toob by editor Dave. Quite frankly I haven’t used it yet, but it looks like it would be a useful item to have for carrying olive oil and balsamic vinegar, two items I use when cooking on the road. The medium sized container that I have is 1.5 ounces. It is soft silicone so it will fit into any space. I anticipate putting it into my cook pot where I always have a little extra room. Humangear also makes a Go-Tubb for pills that is very small, and a Go-Cup that compresses and then pops up in a 4 or 8-ounce cup. REI has a large selection of Human Gear. Emergency Blankets and bags are probably not something one needs unless the bike tour is at a time of the year or location where the weather may change quickly. SOL (Survive Outdoors Longer) makes a number of products for emergency use. I once tried their Thermal Bivvy bag ($33) to use on an overnight warm-weather trip as it is advertised for use as “an ultra-light warm-weather sleep system”. In my one-time experience when the night time temperature was 50°, I became chilly so I had to wear my clothes to bed. The Adventure Cycling website recommended it for above 55°. My bag also split along the side after that one use. Though the split was only an inch or 2 it was annoying. Editor Dave gave me a SOL emergency blanket ($5). Would I use this? Perhaps if I were to go on a tour where I knew the temperatures would drop. Draping it over my sleeping bag may be a nice safety (warmth) feature. The Emergency blanket weighs 3 ounces (vs. the Thermal Bivvy at 9 ounces). 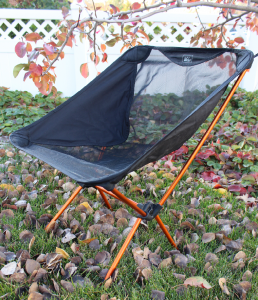 I have tried an REI Flexlite folding chair. This is in the pure comfort and luxury category. Do I really need a folding chair? At my age it was nice to sit in a chair with a back to it. You also sit high enough so that you don’t feel like you are sitting on the ground. It has an advertised weight of 28 ounces but is 27 on my scale, a rare occurrence. I can set it up and put it away in 45 seconds (my wife once timed me casually putting it together). I really do like this chair but it is a decadent luxury. It is especially handy when I was cleaning the bikes on tour or when there is nothing else to sit on such as a picnic table or large rock. It also beats the hard bench of a picnic table. It would have been nice to have in Germany where I took often confiscated café chairs to sit on. The price is $69 for the 4-legged chair, cheaper than the competitors. Insects such as mosquitoes are always an annoyance on an outdoor trip. In my opinion, mosquitoes are a species that could be wiped off the earth and I wouldn’t miss them at all. I do have limits to my conservation leanings. Editor Dave gave me some BugBand brand insect repellent. These are small towelettes are impregnated with a non-DEET chemical. The package contains 2 towelettes and weighs 7.5 grams (0.25 ounce). Depending on where you are, slipping a few of these packets into your handlebar bag may be not only be convenient but also they take up virtually no space and that would be the selling point for use on a bike tour. I (fortunately) have not at the time of writing this article had experience with this product. Each package sells for $1 on the website and you can buy larger sizes.